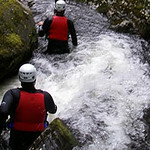 If you prefer your last day of freedom to be doing something that can boost up your adrenaline then try Gorge Walking. Enter into the secret world of craggy rocks and explore. 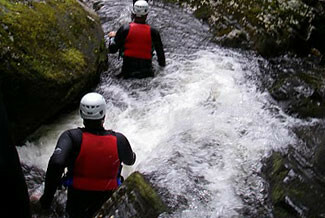 Plunge into waterfalls battle through the rapids explore the dark holes and scramble over the streams. Test your endurance level and step outdoors for an extreme action. Climb and swim through the hills and water and also go trekking through the rocks climb over the boulders and wade through gushing waterfalls. Get kitted in your buoyancy suits helmets and jump from the top to the defying pools beneath. After a short practice session from our team experts you will be able to plunge to greater depths of this exhilarating event with much ease. Wear comfortable quick dry clothes for most activities. It is good to be prepared for both rain and shine. Remember we supply all technical equipment.